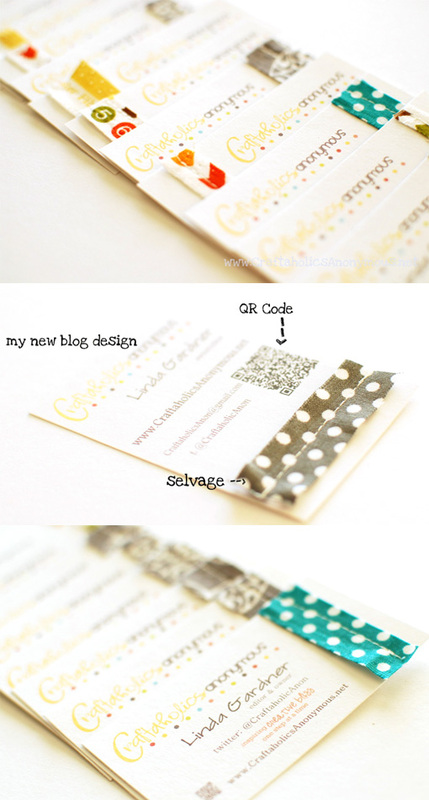 Linda Gardner felt that her current set of business cards for her blog needed a revamp, so she designed a new set which would reflect the crafty nature of the blog. Her design left blank space on either the left or right side of the card which she used to add a three dimensional and textural detail in the form of coloured fabric strips. She used the selvedges saved from past fabric projects as this part of a piece of fabric doesn't fray and is usually thrown away. Using a sewing machine she sewed the fabric strips directly onto the cards. She also made a version of her cards which has a personalised QR code on it, to make it easier for mobile users to go directly to her blog.